texte de la pétition: Justice for Golden Retriever Beaten to Death by Cop! Justice for Golden Retriever Beaten to Death by Cop! 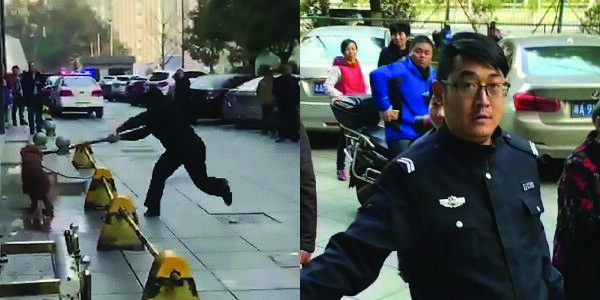 Distressing footage has emerged online showing a police officer in China mercilessly beating a golden retriever to death. According to reports, Hu Hanlin chained the dog to a road barrier and then proceeded to beat him with a wooden club for three hours as pedestrians passed by, watching the bloody act in horror. The officer did not need to bludgeon the dog to death. This was a disturbing example of excessive force and the worst type of cruelty. Please join in calling for Hanlin's removal from the police force. Hanlin and a second officer were called to the scene after two separate pedestrians reported being attacked by a golden retriever. One of the victims suffered a minor injury, while the other only reported slight damage to his clothing. Neither account suggests that the dog was so dangerous that he deserved to be beaten in such a gruesome manner — especially after the police restrained him. The local police bureau responded by saying that Hanlin was carrying out his duty of protecting the public, but a three-hour beating that resulted in the golden retriever's horrific death was completely unnecessary. It was excessive force, pure and simple. Please help fight for justice by signing this petition urging the police bureau to fire Hu Hanlin for his deeply disturbing actions.